Manufacturer & Exporter of Garden Trolley & 4 Wheel Garden Trolley. Our product range also comprises of Tractor Mower, Chain Saw and Electric Hedge Trimmer. We are dedicatedly engaged in offering a commendable range of Garden Trolley. It is suitable for ride on lawn tractor mowers to be used as attachment for transportation of earthen pots and for carrying of other garden machines/ tools. Besides being manufactured from high-grade raw material and latest technology, the offered trolley is inspected properly by our expert professionals. Owing to features like durability and sturdiness, the offered trolley is exceptionally valued by our precious clients. The offered trolley is available with us in various sizes and shapes at affordable price. Our in-depth knowledge and industrial expertise enable us to offer a distinguished range of 4 Wheel Garden Trolley. It suitable for use in garden for moving earthen pots, mud, manure, or any other garden produce upto a weight of 400 Kgs size 80x40x14 inches and a total height of 35 inches. We manufacture this trolley by making use of high-grade raw material and high-end technology so as to maintain the set industry standards. To make a flawless dispatch from our end, our offered trolley is rigorously inspected by our quality inspectors against various parameters. This trolley is broadly acknowledged by our clients for its easy usage and sturdiness. 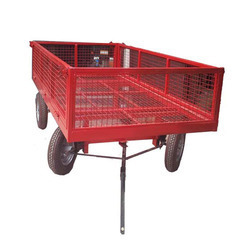 Heavy duty garden trolley which is most suitable for use in garden for moving earthen pots, mud, manure or any other garden produce upto a weight of 400 Kgs size 80X40X14 inches and a total height of 35 inches.